Benefits with Camping Key Europe: camping charge at 4 € discount and 4 € off the price of sauna shifts. 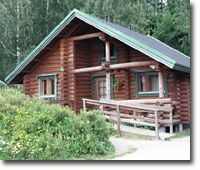 Log cottage consists of a bedroom with a 120 cm doublebed and a separate single bed, a loft with two single beds and a living room with a bedsofa for one. The cottage has also a bathroom, kitchenette and a terrace. shower, toilet, television, dvd player, refrigerator, cooking plate, micro wave owen, coffee maker, toaster and basic tableware. Linen and towels included in price.